KUALA LUMPUR, 29 Aug 2012- By year end surgeons from neigbouring countries will be able to train in advanced keyhole surgery at the Advanced Surgical Skills Centre (ASSC) being setup at The National University of Malaysia Medical Centre (UKMMC) in Cheras here. The ASSC is located in a five-storey building which is being equipped with the latest technology in minimally invasive surgery making it the first such training centre of that magnitude in the region. “Once the Advanced Surgical Skill Centre is in operation to its full potential Malaysia will become a hub for training doctors in the region in cutting edge advanced surgical technology especially in the field of minimally invasive surgery,” said Associate Prof Dr Hanafiah Harunarashid. 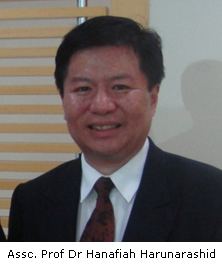 The ASSC will train surgeons in minimally invasive surgery, popularly known as keyhole surgery. Keyhole surgery is a relatively new technique where a surgeon undertake surgery without cutting the patient open. With just a tiny incision of about 5mm, a telescope with a video camera is inserted through the incision which will provide the surgeons visual image of the internal condition of a patient transmitted on to a television monitor. Another one or two incision is made for inserting surgical instruments. Using the surgical instruments, the surgeons can repair the patient’s internal organ. Guided by visuals on the monitor, the surgeons can use the surgical instruments to hold organs, dissect, extract and stitch without cutting the patient open. The two or three small incisions result in less discomfort, faster recovery and leave better cosmetic result as there is hardly any scaring due to the minimal cut. The ASSC will train doctors in complex keyhole surgery like pancreatic removal instead of the routine gallstone and hernia keyhole surgery. Surgeons are normally trained under a residency programme in a hospital, under the supervision of certified surgeons. They will conduct surgery on real life patients. This has been the method of training for years. Residency is the most challenging phase of becoming a surgeon. It is a transition from a student to becoming a sleepless surgeon. “In today’s world patients are more discerning with some refusing trainee surgeons taking part in the operations done on them,” Dr Hanafiah said. Another problem is the increasing number of trainees making it difficult for them to absorb what is being demonstrated. ASSC, he said, will eliminate all such problems as it is dedicated solely for training. There are no patient’s to be housed just doctors who want to learn about the complex surgery. This will eliminate much of the problem of conventional training. The patients are also spared from being the subjects for trainee surgeons testing their skills. “With the ASSC surgeons can train and try to conduct a procedure as many time as they need to polish their skills to perfection, only then can they operate on live patients,” said Dr Hanafiah. Doctors and surgeons have always been trained with a hands-on approach practicing what they learnt on real life situations, which is seeing the patients, making diagnosis and operating on them. But with the ASSC state of the art technology, the surgeons will train on cadaver (people who died and donate their body for science), live animal and human body and organs replica instead of on real patients. This way the trainees can practice their skill on specimens and cadavers without risking the life of a real patient. There will also be replicas of the human body for the students to try out their surgical skills. The ASSC will be equipped with OR 1, a high tech and state of the art operating theatre, which is an integrated high definition operating theatre for advanced laparoscopic surgery. OR 1 allows the surgeon to do most of the work just by touching the computer screen. Fitted with video conferencing capability the OR 1 enables surgeons to collaborate globally during surgery without requiring their physical presence. The equipment of OR 1 worth over RM6 million was donated by Karl Storz, a company that produces and sells surgical instruments. 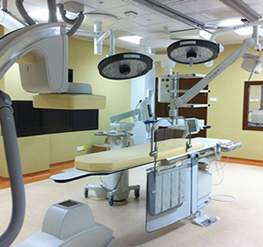 UKMMC is equipped with similar facilities for its hospital. The ASSC will have facilities like dry and wet lab, cadaveric lab, animal OT, specialised skills lab, simulators and vascular endo-trainers once it is fully operational. With the ASSC Malaysia will be at the forefront of surgical training especially for minimally invasive surgery in the region, said Dr Hanafiah. The original proposal was to have the ASSC as a grand building facing a man-made lake with a state of the art semi-circle theatre like viewing area for demonstrations, making it one of the most modern purpose built skills training centre while retaining the classical anatomy teaching room atmosphere at a cost of almost RM60million. But with lesser funds available, the plan had to be redesigned to fit the budget. Yet the lack of funding did not deter the team and the medical faculty. A nurses’ quarters was renovated and turned into the five storey ASSC building. Dr Hanafiah singled out the UKM Vice Chancellor, Professor Tan Sri Dato Wira Dr Sharifah Hapsah Syed Hassan Shahabudin for her vision in making the project a reality and the founder of the project, Distinguished Professor Tan Hock Lim for his contributions to its development. Dr Hanafiah said they are grateful for the funding that they received from the government and the University but the ASSC needs more funding to operate to its full potential. He welcomes any assistance from the private sector to make it into one of the best surgical training centres in the world.